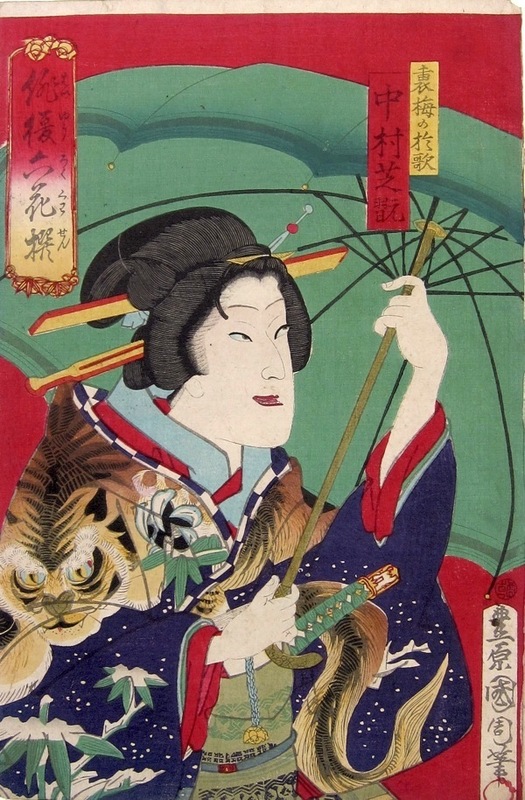 Toyohara Kunichika (1835-1900) Tiger Kimono: Nakamura Shikan as Otsuna from Six Selected Famous Actors (Haiyu Rokkasen), 1873. Oban. Certainly in this series the motif of the umbrella which appears in all six of the prints is presented as a fashionable, positive item, contrasting strangely to our eyes with the traditional costume and onnagata actor reminiscent of Edo culture. This is a beautiful print from a fine series and typical of the style and design of mid career Kunichika. The print is rich with bokashi shading and lavish in its use of Meiji reds and blues. The piece is trimmed to the image and mounted on album backing paper. Colour and impression are fine and condition is excellent. A fine print from the first edition.